The first image here is particularly alluring! Thank you, Tom. 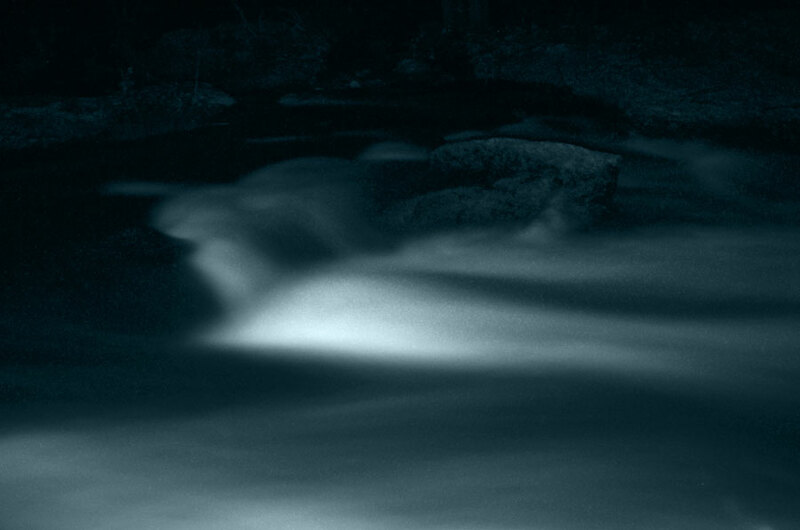 I liked the idea of making abstract images within the rapids. It’s tricky to do in the dark, though – trying to focus and whatnot – I’ll try it again soon! they are wonderfully atmospheric though. Are you planning to make more like this? I love the tones and shifting forms, and the sense of mystery they evoke. Hi Emily, I’m glad you like them, thank you. I will definitely try making some more, I think I’ve a lot to learn here! The trickiest part might be safely transporting a good camera on a whitewater canoe trip… Such a fun process, though! So unique which is what draws me to your work. The 1st one is somewhat spiritual, I really like it. Thanks so much, Mark, that’s very kind of you. I’m happy you find them interesting. The second pis is similar to the cinema! Wow! Thank you! I think night shots really bring out a cinematic feeling somehow. They were fun to make! The softness gives them a sumptuous and otherworldly look. Before reading your text I thought I was looking at film stills from an underground SF movie. They’re really intriguing and full of whispered narratives. Tom’s “alluring” is dead right. I simply follow my co-bloggers, here … 😀 And also like the first one best, so atavistic. Very cinematic ! Love the atmospheric, ethereal quality. It would be fun to try it with a pinhole camera but the exposure would probably be ridiculously long ! Wonderful. I really like the middle one. I appreciate your generously describing all this. I especially like the quizzical people shot! New adventures from you. Love the mystery feeling, Karen. Great photos. Nice shots. (using twitter because using my regular e-mail and WordPress account does not work unless I turn on third party cookies). Lovely work, Karen! Do you edit your photos much, or rely mainly on natural light? Great pictures, Karen! You have such a creative eye. I love how you can take us to another world – another dimension – with your pictures. If you did not explain what is that I would think on the first and third pictures you shot a polar or northern light. Very interesting effect and idea. I like it. Beautiful and mysterious photos. Love the movements caught by an open shutter. 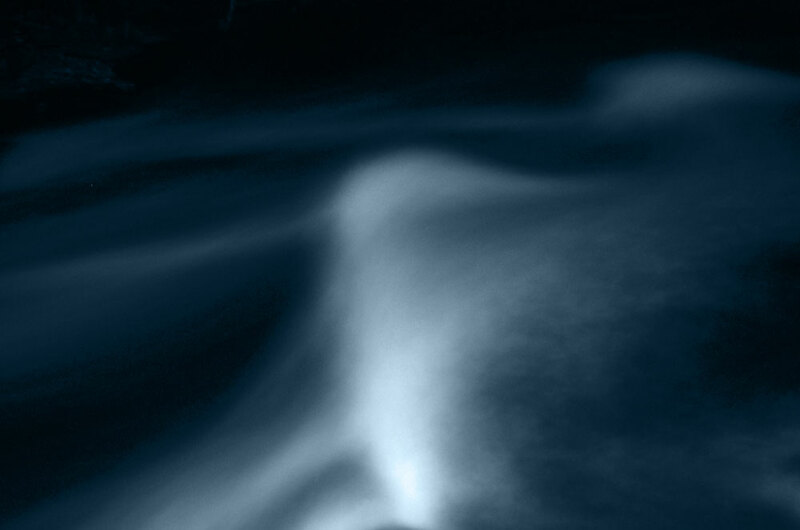 Karen, such chillingly beautiful images – puts a whole new spin on the concept of ‘midnight blue’. 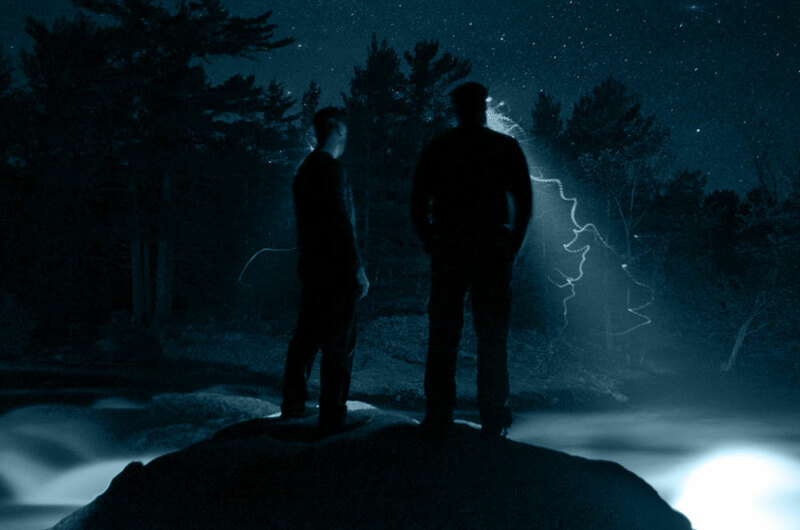 I’m really taken w/ the second image that has the two figures – as that line that’s delineating possibly a fir tree or evergreen of some sort looks like a strike of electricity or lightning! I wish I had your knack for capturing exciting moments such as these, by being in/near water as you shoot simultaneously! Just so amazing. Love your work! Fantastic images! The second one makes me think of E.T. for some reason..! You could start a whole new exploration of your river through this..can really imagine some of your shots illuminated by the night..
A wonderful sense of atmosphere. I particularly like the silhouettes. I applaud the experimentation too. The middle image is magical! So beautiful ! I really love the second image ! Wow, these are just mesmerizing shots…really shows the magic of the night. The middle image captures it so well. brilliant pictures, love that series..!! Even though it should be heavy, I feel it light…completely dreamlike visionary spectacles. Great work, Karen.